Abdullah, the son of the blind Sheikh Omar Abdel-Rahman, writes to request the US release his father, who has been serving a life sentence for allegedly planning the 1993 World Trade Centre attack in New York. In the press statement released in Arabic on Saturday, Abdullah says: "The American administration's arrogance and stubbornness towards one of the Muslim world's scholars, Sheikh Omar Abdel-Rahman, is putting the lives of its people at risk and costing them a lot." Abdullah goes on to justify violent attacks and the kidnapping of Americans by Islamist militants, such as Al-Qaeda, explaining that it is the US administration's treatment of his father that "has pushed the Muslim youth to anger for the cleric." The murder of US ambassador Christopher Stevens to Libya in September during an attack by unknown armed men on the consulate in the city of Benghazi is one example Abdullah cites. The attack on the US consulate in Libya took place on 11 September 2012 in the wake of massive, world-wide protests organised by Islamists to denounce a US-made film mocking the Prophet Mohamed. Abdullah warns in his statement that although his family has chosen to protest peacefully others have seen that "the arrogance of the US is not to be dealt with in any other way except through violence and the killing of Americans." The Sheikh's family, he claims, had demonstrated peacefully and held sit-ins at the US embassy in Cairo for almost 16 months. "We had already warned the US from the anger of the Muslim world," reads his statement. "We hope that the US understands the Muslim world's psyche, especially towards its Islamic scholars." "We further hope that the US responds to President Mohamed Morsi's request to release Omar Abdel-Rahman during his coming trip to the US," Abdullah adds. Morsi, who is expected to visit the US before the end of March, vowed during his presidential campaign to pressure for the release of Sheikh Omar Abdel-Rahman. During his campaign Morsi called Abdel Rahman's case a "responsibility on his shoulders" and that he would lobby for his release. On 8 January, Morsi again repeated his promise during a recent interview with CNN where he stated that he planned to raise the issue of the jailed Sheikh with his American counterpart during his coming visit to the US. 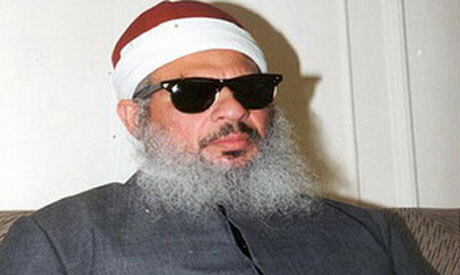 Abdel Rahman is considered the spiritual leader of the radical Gama'a Al-Islamiya group. Do what we say or we will kill you. This a form of Da'wa that will surely convince Americans that Islam is a virtuous Religion of Peace. The Clown Posse of Islam again does a bang-up job promoting the One True Faith. Bravo!!! Is he wearing a Santa Claus hat? Even though islam is not a race, I would keep him in jail just for the simple face that a muslim can't be trusted. Sheikh Omar Abdel-Rahman's release is simply not a worthy cause. I recommend everybody to read the Wikipedia article about him. Even if it's only partly true, no government in the world would have Abdel-Rahman walking around. His son's Abdullah's comments amount to a threat: If Abdel-Rahman is not released, his supporters will kill more diplomats and innocent civilians. Murder as a PR tool and a way to get his will is clearly the method of Abdel-Rahman and his supporters. The sheik should be kept in jail until he dies of natural causes. We the Muslims believe in peace and brotherhood of each others. the Shikh has been in jail for his opinion only. He carried out no attacks. George Bush has killed many Muslims and he is free. What part of 'blind' can't you see? @Democracia, The Sheikh has been blind since his childhood i.e. he committed no murders. It is not fair to put a person with a disability in jail for life, just because you don’t like his views. The west has large number of priests who sexually assaulted boys and still home free. Look no more for double standards!!!. I try it again: Dear Nora, this peaceful Sheikh even (beside other nice things...) spoke out a death fatwa against his brother in Islam, Nobel Laureate Naguib Mahfouz, because of his novel 'Children of our quarter - Auwlad harratina'. He caused so the attack on the most famous Egyptian writer, which nearly killed him and left him very badly injured. Indeed - a very peaceful and brotherly act... Whom you want to fool? All requests from the President to the son asking for the release, on any grounds, of this man will be firmly denied. He had a fair trial and was proven guilty of many serious terrorist activities. There is no credible government in the world who would consider releasing such a man, and in many countries such as Egypt, similar crimes would be punishable by death. Complaints were also made about his prison conditions, he once had visitation rights but he was found smuggling out divisive messages, as a result he lost many of his prison rights. This is a futile waste of time orchestrated for local political consumption for a certain section of the society. He killed innecent people that is considered in Islam Balsmophy. He received fair judgment now and ALlah will judge him after death. In America a man's brown skin is all the proof that is needed to get a conviction. LOL. one of the Muslim world's scholars???? The man is a terrorist, plain and simple.. Why should he be released?? If an american did what he did in Egypt, we would not let him go... he would be killed... so why release this man. Muslims are not angered by him being in prison, real Muslims have no connection to such terrorist organisations!